Today’s story of courage comes from author, Mary Morgan. 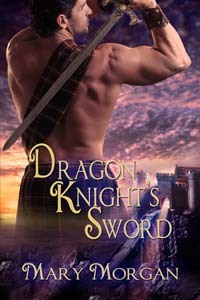 Her novel, Dragon Knight’s Sword, will be released soon by Wild Rose Press. I was 22 years old, never held a job except babysitting, and in a dark time in my life. Never an outgoing person, in fact very shy, I decided to apply for a job at a restaurant for extra money. However, this restaurant was very upscale. You were required to have previous experience, especially in culinary and wine. I knew absolutely nothing, but I needed this job desperately. When I filled out the application, I put down that I had served large family dinners. I believed I could get in the door with that one sentence. On the morning of the interview, I sat in my car for thirty long minutes. I was debating if I should step through those large doors. I kept glancing back at the doors, daring me to get out of my car. Finally, I made the decision that I had nothing left to lose. I got out of my car and pushed those massive doors open. During my interview, I felt a sense of calm wash over me. I smiled and told the manger I was a quick learner. He would not regret giving me a chance. I was hired on that day, and he never regretted for an instant giving me the opportunity to prove myself. In fact, he gave me another position later on as the bookkeeper. I excelled and left for the banking industry. Therefore, each time I venture down a new and sometimes frightening road, I remember that day I found the courage to push through those doors. It took me on an amazing path, for which I will be eternally grateful. Not only did it teach me important life lessons, but it also led me to my soul mate. I married the manager of the restaurant three years later. I am a constant daydreamer, and have been told quite often to remove my head from the clouds. Yet, this is where I find the magic to write my stories. Not only do I love to weave a good tale, but I have a voracious appetite for reading. I worked for Borders Books for almost fourteen years. Imagine my delight to be surrounded by so many books, talking to others about them, and getting paid. I have traveled to England, Scotland, Ireland, and France. There are those who know me well when I say, “My heart is in the Highlands.” I believe I have left it there, or maybe in Ireland. When not writing, I enjoy playing in my garden–another place where magic grows. Of course, there is time spent with my family. They are the ones that keep me grounded. Can the healing power of love mend the soul of a wounded warrior who destroyed the life and love of another? Duncan Mackay will do anything to lift the curse from his family — even forfeit his own life. But his plans change when he encounters the woman from his dreams, literally. She is from the future, somehow has his lost sword, and can talk to the Dragon that is able to lift his family’s curse. Brigid O’Neill has spent her life listening to the mythological legends from Ireland and Scotland. So, when an ancient sword lands at her doorstep and she starts dreaming of a rugged Highlander, she drops everything and takes on a quest which will alter everything she believes. This entry was posted in Uncategorized and tagged Courage, Dragon Knight's Sword, Highland Courage, Mary Morgan. Bookmark the permalink. Mary, you are very welcome. Thank you for being a part of my Month of Courage and for sharing this great story. I can’t wait to be able to announce the release date for Dragon Knight’s Sword. I shudder to think what would have happened if I had never taken those steps out of my car. It is one of those moments in my life where I can remember every detail of that morning — from looking out across the parking lot, the color of my dress, my hands holding the application. Yet, the moment I walked through those oak (yes, they were oak) doors, my life changed. Love you my friend! It was my destiny and the first time I had the courage to do the impossible. Now my mantra is, “I’m possible!” (((HUGS))) Judy! Awww…thanks Mimi. 🙂 I’m like a child at Christmas waiting for my present, so I can share it with the world. Love you, too! Mary Morgan is my daughter and I am so filled with pride. She grew in my womb underneath my heart for 9 months and was a joy from the moment I first held her in my arms. The shy little girl is a strong,bright,lovely woman who is realizing her dream. She has shown courage in impossible situations and inspires me daily. 😀 I know what you mean Anne. I look at my own children who, through hard work and perseverance, are just beginning to realize their dreams and I am in awe. So glad you enjoyed it! This was one of those moments in my life that remind me of those places in the road with boulders — you can either retreat, or find a way to get through. I believe I chose wisely. Mary, what a courageous and romantic slice of your life you shared with us today.At the same time it reminded me of an excerpt from a Highlander romance novel that doesn’t exist. ……………………………. It was a dark time. She sat and stared at the large OAK doors that she needed to pas thru. Did she have the courage to take those few but long steps to change her life for possibly the better? Well, she had nothing left to lose. I do not make light of your show of courage. I just could not help this scenario. Besides a little comic relief is always good, eh ? BTW If your manager/husband appears to be a sexist pig, I told you this was a Highlander romance. Just gotta love those alpha males ! OH MY GOSH! Were you there? The first thing he noticed about me was my smile and he couldn’t trust himself. Actually, I’ll share another secret — when he came out for the interview, he slipped on the floor and slammed into those oak doors. Upon standing, he straightened his three piece suit and said, “About damn time someone waxed these floors.” My heart soared at that moment. That is hilarious and a good comeback ! Nope, wasn’t there but you painted a good visual. I do enjoy writing but even when inspired, I’m only GOOD for about three paragraphs. Kinda like a green boy with his first woman. You, Ceci and Sue-Ellen write the books. I’ll write the quips ! Mary, I admire the strength and pluck you showed. What a moment! If we could all manage with such grace and dignity. Thank you Cecil so much for opening your heart to Mary and bringing her to your blog. I can not wait for you and the rest of the world to read her stories. Thank you Leah. I know what you mean, it brought tears to my eyes just typing it. I’m only this way because I had such a wonderful example of unconditional by her. And I am blessed to share it with you. Love with hugs! Yes, Ceci’s month of “courage” stories is amazing. I was fortunate to have won an ARC of Highland Courage and she weaves a beautiful tale. You will love this story, Amanda. Thanks Mary! It has been so nice having you here today. It is so lovely that both your mother and your daughter stopped by! Beautiful story of courage, Mary! (((HUGS))) and love sent your way! You made my day, Leah! Thank you so much dear kindred sister. At this point, I’m on pins and needles waiting to hear on that release date. (((HUGS))) with love. Me too Leah. It sounds like a wonderful book. I can’t wait! Mary, I’m a little late, but enjoyed your story of courage. You have been a good friend and have encouraged me to take my own steps toward the future. I can’t wait to read your creation. This has been a great day Mary–so very uplifting. Thanks for sharing your time and your story with me.